Psilocybin is a chemical substance. It can cause hallucinations when eaten, and has also been found to reverse psychological conditioning, grow brain cells and heal the brain. 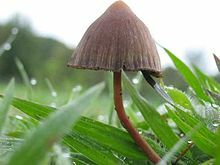 It occurs in many kinds of fungi and mushrooms, most notably Psilocybin mushrooms. Most of these are known as psychedelic mushrooms. The substance is used as a recreational drug. It is illegal in many countries. This page was last changed on 30 November 2016, at 05:39.